The kind of media coverage he’s talking about are studies that show there are a lot more female doctors than there used to be, more female university graduates, news announcers, and men made out as wimps in TV ads. Ironically the guys in the group are all ultra-conforming snobs in natty sports coats huddled around their leader/boss/head snob seated in what appears to be a country club setting. 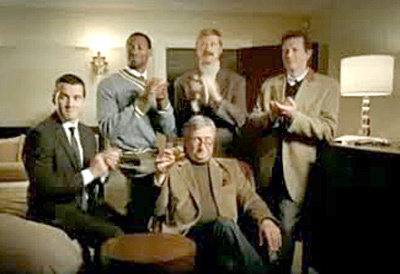 Without saying a word the head guy knowinly toasts the hero. The other guys obediently follow suit. Now doesn’t that just say it all?